The 115th edition of the IFA Shield kicks off with ten teams vying for the coveted trophy. TheHardTackle analyzes the strengths and weeknesses of teams in Group-A and predicts the possible permutaions and combinations. Let’s find out which will be the two most likely teams to make it to the semi final stage. Arguably the more tougher of the two groups which houses the only foreign element in this year’s IFA Shield – Chinese top flight club Shandong Lueng FC. The group comprises of Kolkata giants East Bengal, Mohammedan Sporting, Southern Samity and Churchill Brothers besides the Chinese side. They started the season on a promising note roping in former India great I.M Vijayan as their head coach and Subhash Bhowmick as their technical director. But half way into the season they had none of them at the helm of the affairs. Bhowmick left for Mohun Bagan after the sacking of coach Stanley Rosario, while eight games into the Sahara Calcutta Football League, I.M. Vijayan got the boot for poor performance after accumulating just ten points in their first eight games with three wins and a draw. They had a decent team with two Brazilians – former East Bengal & Chirag United striker Edmilson Marques and former Mohun Bagan midfielder Marcos Pereira – in their roster, but they failed to live up to the expectations after promising so much. The IFA Shield gives them a chance at redemption and more importantly a final shot at competitive football before they embark on their biggest tournament of the season – the second division I-League. In addition to Marcos and Edmilson, they have a couple of decent players. 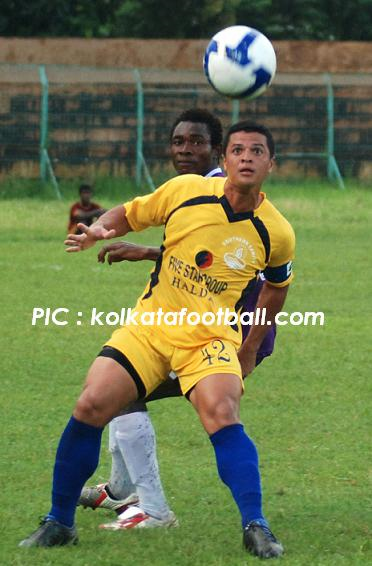 Francis Xavier, a striker had a decent season for them in the Calcutta League scoring vital goals at crucial juncture. They have Kaushik Biswas in defence who can be very dependable at times. In goal they have the solid Amit Singha Roy – former Air India custodian. However considering the players at their disposal it has been a disappointing season for them. Their eleventh place finish in the Sahara Calcutta League was a major let down. 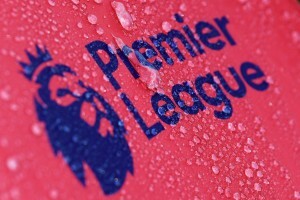 They lost eight games out of 16 – not a pleasing sign for the club owners who had pumped in considerable amount of money. They scored a decent 22 goals but also conceded 18, something that will give their new coach Carlos Roberto Pereira da Silva plenty of worries. Coach Carlos is not new to the IFA Shield having won the tournament last year with Churchill Brothers – the first and only Goan team to win the coveted competition. Now the Samity fans will be hoping for an encore. Mohammedan Sporting are no strangers to the IFA Shield having won it five times in their glorious history – the last coming way back in 1971. The “Black Panthers” of Indian football have had a decent season. They finished fourth in the Calcutta League with 30 points, 13 behind winners East Bengal. Their team has some seasoned campaigners in the form of Brazilian Eduardo Escobar, Dipendu Biswas, Suraj Mondol, Satyajit Bose and Habibur Rehman. They already have one piece of silverware this season after beating Techno Aryans to win the All India Airlines Gold Cup. However Coach Fuja Tope will certainly find the going tough in the IFA Shield. A top two finish looks highly unlikely. A win against Southern Samity would be a job well done for them. They could also surprise East Bengal who will be resting quite a few key players. Again like Southern Samity they will be looking for a good workout before the I-League division-II kicks off. Dipendu Biswas, their captain will be their player to watch out for along with their promising goalkeeper Priyant Singh – who played for East Bengal last season. Eduardo will once again shoulder the responsibilities of banging in the goals. The defending champions will go all out to defend their crown after beating Mohun Bagan 2-0 in the final last year to become the first and only Goan team thus far to lift the prestigious trophy. They conjured up a sensational week last year by beating Mohun Bagan in the final of the IFA Shield and the Durand Cup in a span of seven days. 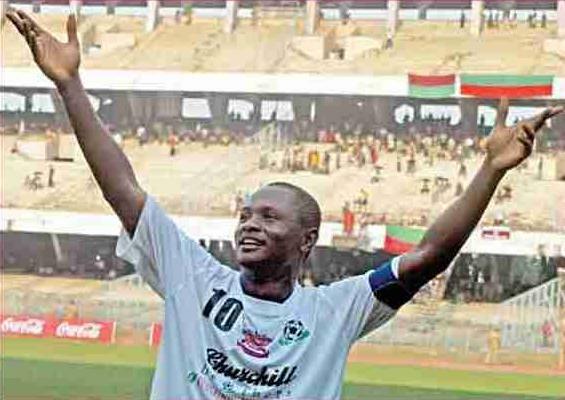 The hero on both occasions then was Odafa Okolie – their talismanic striker and once again he will carry the hopes of the entire state of Goa on his shoulders. Churchill will play their near full strength side. This could be their last hope of silverware this season as they are already seven points behind Salgaocar in the I-League and look unlikely to lift the title. They will be coachless too after the sudden resignation of their Singaporean coach Vincent Subramanium. Churchill will definitely have to play at their best to qualify for the semi finals. Chinese side Shandong Lueng certainly look the favourites to top the group. East Bengal even with a depleted side are a handful while Southern Samity and Mohammedan Sporting will certainly be no pushovers at home. However if Churchill start with a full strength side as expected, they could be in a very good position to qualify for the semi finals. They have a plethora of attacking options at their disposal. Odafa and Vincent have combined well for them in the I-League. They also have riches to choose from in midfield with Brazilian Amaury Nunes, Zakeer Mundampara, Steven Dias and Mohammad Rafi their probable midfield line up. The defence will once again be marshaled by Gourmangi Singh, Dharmaraj Ravanan, Rowilson Rodrigues, Robert Lalthalma and Denzil Franco. East Bengal has rested almost half their side. Tolgay Ozbay, Penn Orji, Mehtab Hossain, Naoba Singh and Uga Okpara have all been rested for important battles ahead in the I-League and AFC Cup. Even Trevor Morgan is vacationing. Tushar Rakshit will take over as coach and he will have a young side at his disposal. But one things for sure – the IFA Shield brings out the best in East Bengal and whether they have a depleted side or not, they will go gunning for the title. 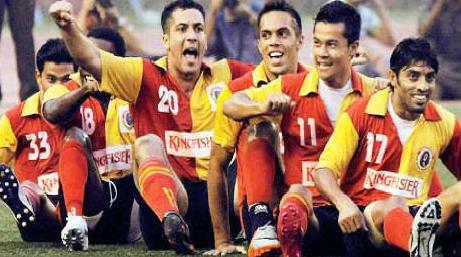 27 times they have lifted the shield that has a special place in the hearts of all East Bengal faithful. Even with a half strength side East Bengal have some quality players. The ageing Alvito D’Cunha, provided he regains his fitness, is still a handful for defenders. Harmanjhot Khabra along with Mehrajuddin Wadoo, Reisangmei Vasum and Sanju Pradhan will most probably make up the midfield that looks more than decent on paper – certainly decent enough to challenge Churchill Brothers and Shandong Lueng. Can Red-&-Golds win it for a record 28th time? Baljeet Singh Sahni and Robin Singh will have to get the goals for the Red and Golds in the absence of Tolgay. You get the feeling that it will be a fight between East Bengal and Churchill Brothers for the crucial second spot with Shandong Lueng expected to top the group. How seriously East Bengal take the IFA Shield is a million dollar question though, which only time will tell. The Chinese side is the only foreign team in this year’s competition and are one of the favourites to lift the title. Founded in 1988, this team has its headquarters in the Eastern city on Ji’nan. They have been regulars in the AFC Champions League for the past three years and look a top quality side on paper. Manuel De Brito Filho, their Brazilian striker could prove a handful for the other teams. They also have young Chinese attackers in Gao Di and Han Peng. The experience in midfield comes from their foreign import – Roda Antar of Lebanon. The rest of the midfield comprises of young Chinese players like Zhou Haibin and Cui Peng who are relatively unknown and could spring a surprise or two. The defence is marshaled by Brazilian Renato Assis Da Silva and Ricardo Jorge Pinto Da Silva of Cape Verde Islands. In this years AFC Champions League they are placed in Group G along with Cerezo Osaka of Japan, Arema of Indonesia and Jeonbuk Hyundai Motors of South Korea. This tournament will be the perfect stage for the Chinese side to test their bench strength against quality Indian opposition. They are expected to top Group-A and make their way to the semi final stage.